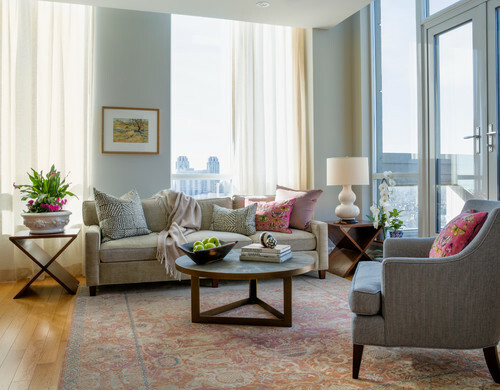 Whether your style is traditional or modern, relaxed or formal, bold or subdued, your living room should be a place where you can feel comfortable, let down your guard and spend quality time with friends, family or just yourself. There’s an art to decorating a room that looks great and works well for you. So before you dive into a living room redesign with your pro, arm yourself with a few designer tips and tricks. .
1) Mix light and dark. When a living room is all white and bright, it can feel too “clean” and unapproachable. When it’s all dark, it can feel like a cave. But mixing dark and light colors creates a dynamic look that has depth and balance. The design of any space benefits from the inclusion of at least a little white and a little black. 2) Contrast your neutrals. Beyond including some white and some black, decorating a living room with a variety of contrasting neutrals goes a long way toward making it feel rich and welcoming. 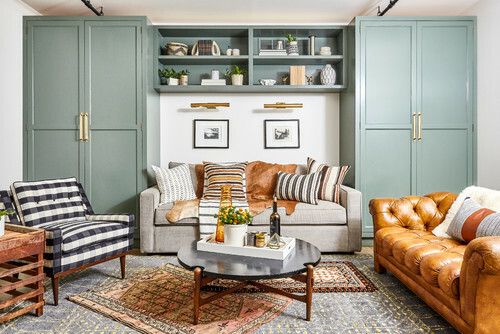 In this example, the white walls, caramel leather, brass hardware, gray sofa and blue-gray cabinets all contrast with one another, which highlights their different finishes and undertones. This makes the palette feel rich even before other key elements, such as color, pattern and texture, are added. 3) Work in some wood. 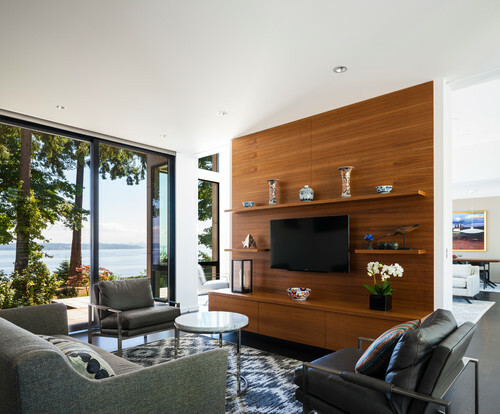 Wood is one of the top materials for bringing a sense of warmth to a living room. 4) Add a dash of color. While you can create a beautiful space without any vivid hues, adding even a little bit of color to a living room can go a long way toward creating a relaxed and inviting atmosphere. When in doubt, look to a cheerful blue — it’s a hue that usually everyone can agree on. It perfectly contrasts warm elements such as leather and wood, and it feels just neutral enough to work with basically any other future accent colors. 5) Consider conversational distances. No matter how big your living room, there’s a limit to how large a seating group can be and still make sense for intimate conversation and cozy gatherings. A good distance between seats to facilitate conversation is about 8 feet, meaning if you have several sofas or a sofa and side chairs, the seating area should have a diameter of 8 feet, or 4 feet out from the center. A huge, 12-seat sectional sofa may look great and be perfect for a party, but if you’re looking to create a cozy living room, it’s usually best to use fewer, smaller seating pieces and push them a little closer together.